Starring Maricel Soriano, Dingdong Dantes, and Lovi Poe, this new teleserye with a "mistress" theme seems to have a fresh take. (SPOT.ph) There seems to be a lot of attention being focused on mistresses lately, judging by the teleseryes that have been coming up one after the other on primetime. The series opens with a shot of a long and winding highway with motorcycle racers whizzing past. In the background, we hear fast-paced music, a gloved hand grasping the handlebar and a boot resting on the pedal, then we see a closeup of Dingdong through his helmet. We then hear Maricel's voice saying, "Life is a race and our aim is to chase for our dreams." Was this a reference to that famous line in Working Girls? The shot is clean, clear, and crisp-as if we're watching a movie. That's how polished the teleserye is today, and this quality sets a brisk and exhilarating tone for Ang Dalawang Mrs. Real. But it seems the series is too much in a hurry to tell its story, as the succeeding sequences would show. It is established that Maricel's character, Millet Gonzales, enjoys a successful career as an educator and that she comes from a well-off family with loving and suppportive parents, Henry (Robert Arevalo) and Aurora (Celeste Legaspi). Millet seems to have everything except true love, of course, which she yearns for. But as her mother explains, "Love is an accident waiting to happen." Quite literally, this aphorism is how Millet meets future husband Anthony Real (Dingdong Dantes). He rushes to her aid in the course of an accident (nice tweaking of this melodrama "vehicle"), and in the ambulance, she has her first blurry view of her handsome future husband. Cut to this interval and Millet and Anthony are celebrating their 10th wedding anniversary. The viewers are thus deprived of a glimpse into the couple's first decade together. So we have no clues explaining the near-future (the second Mrs. Real, Lovi Poe's character Sheila Salazar) that we can predict anyway, even with a chockfull of spoilers. 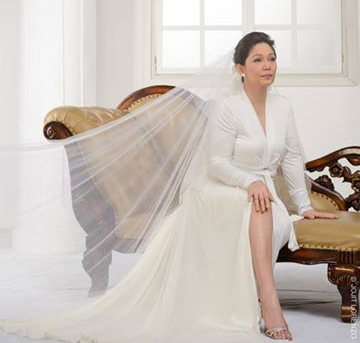 There have always been two distinct facets of Maricel's persona: the rampant comedienne nurtured by her screen father, Dolphy, and the drama queen of Soltera and A Love Story, channeling Vilma and LT, and luxuriating in the elegant pathos of the best in Pinoy melodrama. This is the Maricel we see in Dalawang Mrs. Real. It's a template that Lovi Poe has also mastered in her GMA series, and in her critically acclaimed performance in the indie film Sana Dati. But here she assumes a spunkier persona-the free-spirited, independent, and younger Mrs. Real. Besides Robert Arevalo and Celeste Legaspi, Jaime Fabregas and Coney Reyes (as Anthony's parents, Jun and Sonia Real) also turn in wonderful performances. The back story of these elders in the lives of Millet and Anthony, especially in terms of how they influence this couple, also reveals some solid writing in this serye. If there is anyone in the series who upsets Millet's demeanor, apart from her father belittling her husband, it must be her meddling domestic who periodically reports to her mother-in-law Anthony's maltreatment by his father-in-law. She even taunts Millet's adopted son who has ADHD and has difficulty reading. Quite daring for this serye to cross over into these culturally sensitive areas. Anthony's first encounter with Sheila at a mall is an instant giveaway of his character as a dutiful if potentially unfaithful husband. Naturally this scene is fitting for a double-entendre dialogue, in true melodrama fashion. A saleslady inquires if there's anything else he likes. "Oo, pero gustuhin ko man, hindi na pwede. May asawa na ako." It's the domineering mother-in-law we're used to watching in most television dramas. But in this show, it's Anthony's father-in-law, appropriately named Henry (which means home ruler; consulting a dictionary of names is SOP for scriptwriters), who is the cause of misery in Anthony and Millet's otherwise stable domestic life as a couple. Robert Arevalo is always a joy to watch even in roles that are beneath him. Yes, there's another highway encounter that the writers of this serye have deemed to be similar to how Anthony meets Millet. (And there's also yet another highway incident involving a random little boy whose ball gets stuck under a car and whom Anthony helps.) Anthony's running into Sheila is a more complicated encounter that leads to the latter's epileptic fit or what seems like it. This is a teleserye, after all, so anything that aggravates what should otherwise be typical happenstance is welcome. So they end up in a hospital and this is where the premiere telecast ends, but we're given a glimpse of the next episode, when Anthony calls his wife to explain that he had to help somebody or words to that effect. This is a serye, all right. The plot gears up like a car on a freeway. It may seem a trifle, but that score, every time a new sequence is underway, is so very much like The Legal Wife. Considering that both shows have the same theme, must they also share the same music? Yet all in all, an exciting first episode, and this show promises a different take on the mistress theme.